Disney's All-Star Music Resort is one of the five Disney World Value resorts, providing an economical option for families who want to enjoy the benefits of staying at an official Disney World hotel. Disney's All-Star Music Resort has 1706 guest rooms including standard rooms that can accommodate up to four guests per room or five guests if the fifth person is a baby in a crib. Family Suites can accommodate up to six guests or seven including a baby in a crib. The resort draws its inspiration from popular musical styles like Country, Jazz, Broadway, Calypso, and Rock 'n Roll. Each building carries a musical theme in its interior and exterior decor and the colorful hues make this a fun choice for young and old alike. The 260 square foot Standard Rooms are fairly basic but they're clean and cute and are very popular with guests on budgets or who spend a lot of time in the theme parks. The 520 square foot Family Suites include kitchenettes, bedding for six, and two bathrooms. The resort has two themed swimming pools, the Calypso feature pool, and the Piano quiet pool. The Guitar-shaped Calypso pool has organized poolside activities for children during the afternoons and a poolside Disney movie each evening. Get a Quote for this fun resort! Advantages - Clean, comfortable two cute pools and colorful Music themed buildings. The value resorts enjoy many of the same benefits as the more expensive resorts - things like "Extra Magic Hours" or free Disney theme park transportation - but at a much lower price. Guests can also take advantage of the Disney's Magical Express - complimentary transportation between the Orlando International Airport and the resort. As of 2012, all rooms now have mini-refrigerators at no extra cost. This is the only value resort that combines Family Suites and Standard Rooms in the same buildings, offering family reunions and large groups flexibility in room size with the ability to stay in close proximity. Disney's All-Star Music and All-Star Sports often receive the biggest discount for promotions on room rate. The All-Star Music Family Suites typically cost less than the family suites at Disney's Art of Animation Resort, although the InnovaBeds at Disney's Art of Animation Resort are more comfortable for families traveling with grandparents or older children. Disadvantages - The standard rooms are small - 260 square feet - and basic; they're fine for people on a budget or who spend most of their time in the theme parks and just want a clean, convenient place to sleep. During low seasons or off-times, the All-Star resorts might share buses and, in that case, the All-Star Music resort is typically the second stop. The value resorts do not have slides at the pools. There is a food court but the resort does not have a table-service restaurant. The Family Suites are a nice option for larger families but adults and teens may find the sleeper sofa and sleeper chairs in the living area a bit uncomfortable, though younger kids don't seem to mind. The Guitar-shaped Calypso Pool with Three Caballeros Fountain. Jogging Trail - Approximately 1 mile around the Disney's All-Star Resort complex. Trail maps are available at the concierge desk. Intermission Food Court - a cafeteria style, quick service restaurant serving Breakfast, Lunch, Dinner and snacks. The Intermission Food Court is a Disney Dining Plan Quick Service Location. Singing Spirits Pool Bar - Specialty drinks, beer, sodas, etc. This resort does not have a table-service restaurant. Maestro Mickey's Gift Shop in the Melody Hall Building for sundries and souvenirs. You can save time and money by having snacks, and bottled water delivered directly to the resort by Garden Grocer - Click HERE for more information. Regular hotels rooms do have mini-refrigerators but do not have microwaves or coffee makers. Family Suites have mini-refrigerators, coffee makers and microwaves. Standard Room – Sleeps up to 4 (or 5 with a crib). 2 double beds or 1 king bed. 260 square feet. Family Suite - Sleeps up to 6 (or 7 with a crib). Queen bed and bathroom. The Living Area features a kitchenette (microwave & refrigerator) with a full-size sleeper sofa and 2 twin-size sleeper chairs. These units have 2 TV's and 2 full size restrooms with combination tub/shower. 520 square feet. Preferred Location Rooms - These rooms are the same size and style as the standard rooms but are located closer to Melody Hall (lobby), the Bus Stops, and the Guitar pool with the Three Caballeros fountain. These rooms are located in the Calypso and Jazz buildings. Accessible rooms for guests with disabilities, including wheelchair and hearing accessible rooms. TTY equipment is available upon request at check-in. Service animals are welcome. Wheelchair accessible transportation available to the theme parks. 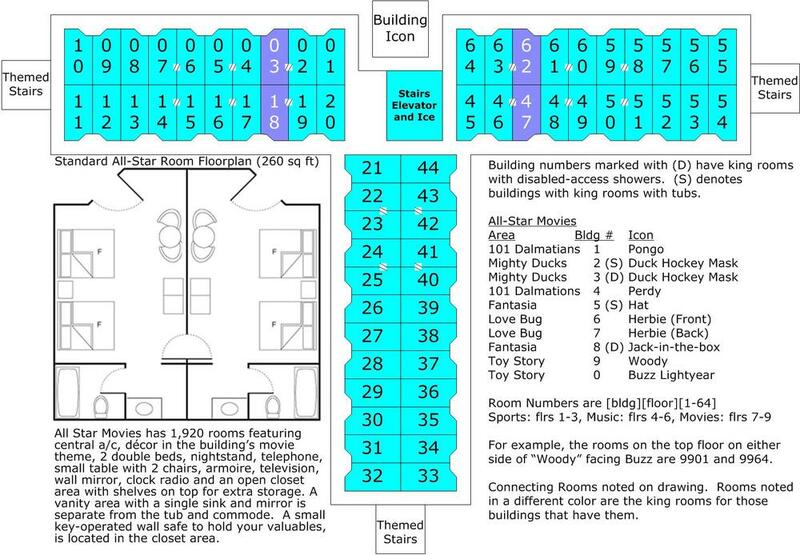 There are several connecting Standard rooms - two rooms joined by an interior door - at Disney's All-Star Music Resort. There are no Family Suites that connect to a standard room. All rooms with one king bed have the option of connecting to a room with 2 double beds, a nice option for larger families. Family Suites - 1 queen bed, 1 full-size sleeper sofa, and 2 sleeper chairs with kitchenette and 2 bathrooms. Combination Bathtub/Shower with 1 sink in the vanity area in most rooms. Large roll-in shower stall in handicap accessible rooms. Pack ‘n Play Crib available upon request. Mini-Refrigerator now standard in all Disney value resort rooms. Disney's All-Star Music Resort includes rooms available to Guests with disabilities, including wheelchair-accessible bathrooms and rooms designed for the hearing impaired. Complimentary wheelchairs are available on a first-come, first-served basis and cannot be reserved in advance. Guests who require wheelchairs are encouraged to bring their own equipment or make arrangements with an Orlando-area vendor prior to arrival at Walt Disney World Resort. Elevators available directly behind the themed icon of each building. Guests may use Disney's Magical Express - a shuttle bus service included in your reservation - between the Orlando International Airport and Disney's All-Star Music Resort. Disney buses are available to take resort guests to the Walt Disney World theme parks, Typhoon Lagoon & Blizzard Beach Water Parks, Downtown Disney and ESPN Wide World of Sports Complex. TIP: The three Disney All-Star Resorts look very similar so be sure you are at the right resort before exiting, when the All-Star resorts share buses. Complimentary transportation to the Disney World golf courses is arranged through the resort concierge desk. Guests must have a tee time reservation with confirmation number and transportation should be arranged the day prior to your tee time. We love the fact that Disney's All-Star Music Resort is clean, fun, and has all the Disney benefits at price that normal people can afford. It may make sense to splurge on a moderate or deluxe hotel if you'll spend enough time at the resort to enjoy the amenities but the value resorts are a great fit for guests who spend almost all of their waking hours in the theme parks. We also think that All-Star Music has an ideal location because it is in-between the All-Star Movies and All-Star Sports resorts, making it easy to walk to an adjoining resort to enjoy the food court or swimming pools. We wish the value resorts had queen beds and it would be nice if the pool had a slide but those are our only real complaints. Let's get started planning a great vacation! Disney's All-Star Music resort opened on November 22, 1994. Disney's All-Star Music is often abbreviated ASMu by Disney fans. The Gold Star in the front of All-Star Music is 55 feet high and weighs 55,000 pounds. There are identical starts at the entrances of the Disney All-Star Movies and All-Star Sports resorts. The conga drums on the Calypso buildings are slightly larger than the buildings on Main Street USA in the Magic Kingdom. There are more than 930 banana leaves decorating the Calypso Buildings. The Cowboy Boots in the Country Fair area are size 270. Look for a Mickey Mouse head shape in the design on the front of the boots. There are more than 80 records on the balconies of the Rock Inn Buildings. The top hats in the Broadway area are size 125. One of the marquees in the Broadway section features Disney's Broadway production of Beauty and the Beast. It opened on Broadway, in New York City, in 1994 - the same year that Disney's All-Star Music Resort opened. Disney's All-Star Movies Resort has been recognized by the Florida Green Lodging Program for its environmentally responsible practices. Disney's All-Star Music Resort is right between Disney's All-Star Movies and All-Star Sports Resorts. Guests of one All-Star resort are welcome to use the swimming pools and food courts at any of the other All-Star resorts. Disney's All-Star Music Resort has 10 buildings that are three stories high. Each building has stairs and elevators. Preferred location rooms are closer to the resort bus stop, food court, and feature pool but can also be noisy due to all of the activity in this area. Request a top floor room to enjoy a quieter stay at Disney's All-Star Music. A lot of trivia came from an article on the Disney's All-Star Music Resort by Don Myers Jr. in the March/April 2012 issue of Celebrations magazine. Photo credits: All photos are our own.